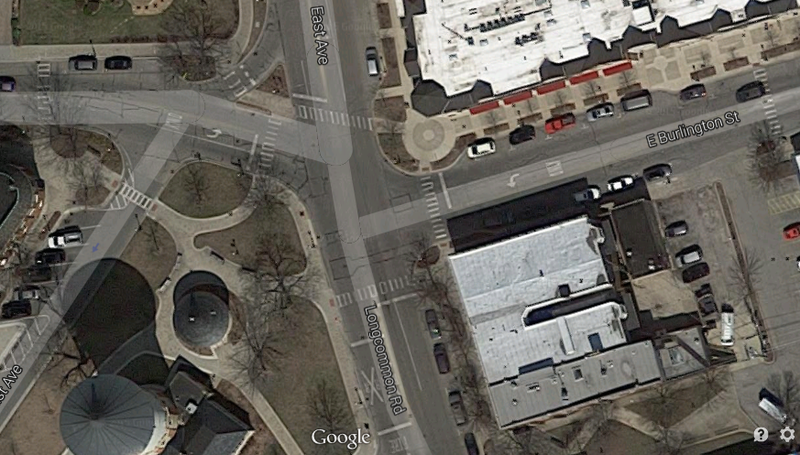 Aerial photograph of area in Riverside, IL where a bicycle commuter was injured in bike accident. The Illinois Bicycle Lawyers at Keating Law Offices have recovered the entire amount of the insurance policy limits for a Riverside bicycle commuter who was severely injured in a bicycle collision last June. The bicyclist regularly commuted via bicycle from her home in Riverside to her job in Berwyn at a healthcare facility. The collision occurred as she was riding her regular route to her Riverside home. On June 17th she was riding near the Riverside Metra station and crossing Longcommon Road in the crosswalk. At the same time, a teenage driver inexplicably sped northbound on Longcommon Road towards the crosswalk. The motorist struck the bicyclist in the crosswalk in the rear tire of her bicycle. The force of this impact projected the bicyclist from her bicycle. She then landed on the pavement and violently struck her head and face. She was taken by ambulance to a local hospital where she received medical care. She continued to receive follow-up medical care for months after the collision. Attorney Mike Keating attended traffic court at the Maywood courthouse with the injured bicyclist. It is critically important that injured bicyclists attend traffic court to ensure that all available testimony is available to assist prosecutors in pursuing charges against the at-fault motorists. In this particular case, the motorist was accountable for his actions when faced with the prospect of a trial. He pled guilty in court to the charges and thereafter personally apologized to the injured bicyclist. This claim was able to be quickly resolved for the available $100,000.00 policy limits from the national insurance carrier that is not known for quick or fair resolutions to claims. Ultimately, this was the best possible financial resolution in the case. We continue to assist the client with obtaining all of the medical attention she requires by working with her health care providers and her health insurance company.